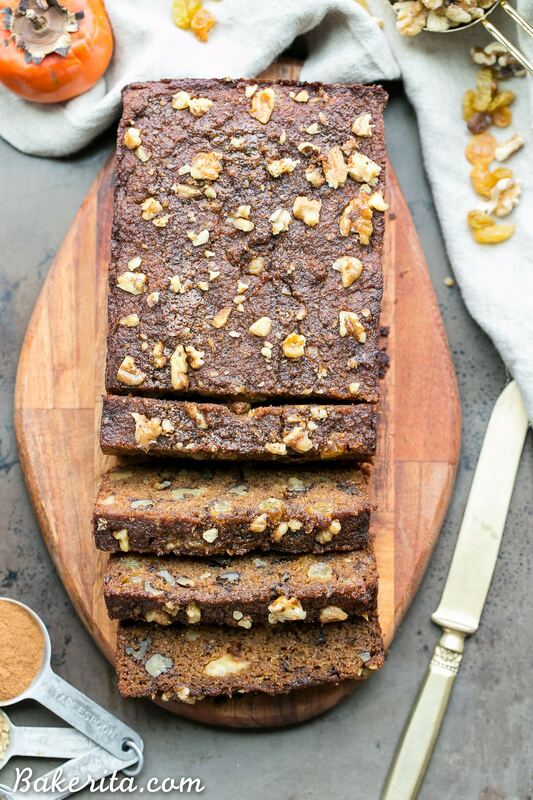 This Paleo Persimmon Bread is a healthy treat that uses pureed Fuyu persimmons for flavor and moisture, and is loaded with toasted walnuts & golden raisins! 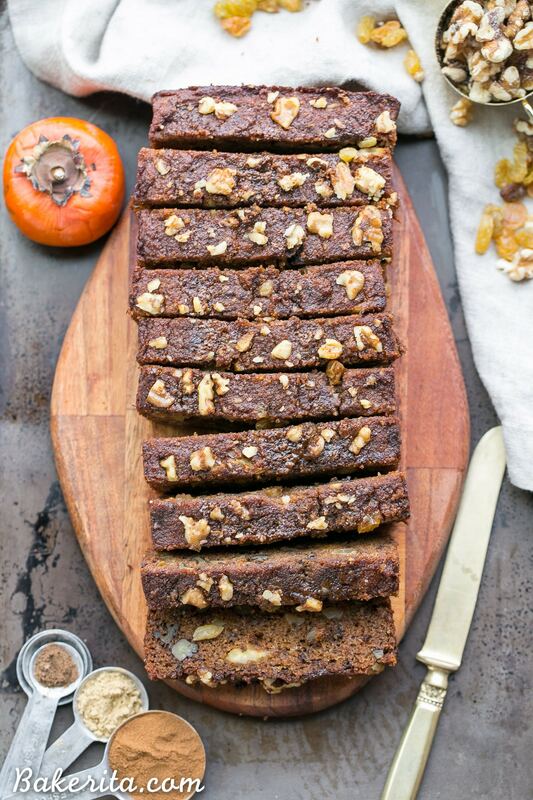 This gluten-free persimmon bread is spiced with cinnamon, ginger and allspice and makes a perfect breakfast or snack. Ugh, don’t you just hate when the days get shorter because of daylight savings time? As I’m writing this, it’s barely 5 P.M. and it’s already dark and dusky…and I’m sitting here really missing the 8 P.M. sunsets from summer. The San Diego’s farmers markets are one of my favorite things about being back living here – mostly because all year round, they’re packed with fresh fruits and veggies of all sorts. My favorite to gawk over are the tropical fruit vendors, selling passion fruits, dragonfruits, lychees, and guavas. Since I recently moved, I’ve been going to a new farmer’s market just a walk down the street from me – while exploring there a few weeks back, I loaded up on organic persimmons. After hemming and hawing over what to do with them, I decided I wanted to make persimmon bread, but a little differently than I had before. Historically in my persimmon bread making adventures, I’ve used chopped persimmons in a lightly spiced loaf bread, but for this paleo persimmon bread, I blended the persimmons into a beautifully colored persimmon puree, which is added to the loaf to provide a ton of flavor, moisture, and color. 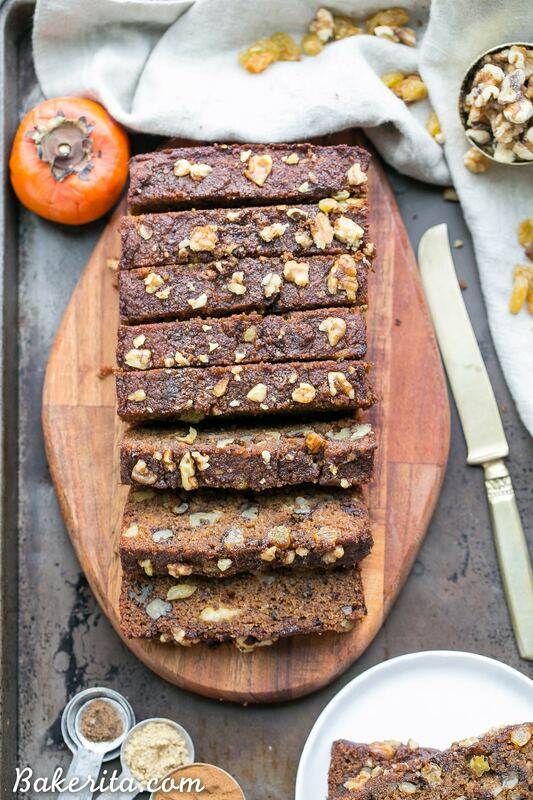 The persimmons have a sweet, fruity flavor that permeates the loaf. If you’ve never had a persimmon before, there’s two main types: Fuyu and Hachiya. Fuyu are more common (at least around me) and are sweet to eat when unripe and turn soft and super sweet when they’re ripe. Hachiya’s, on the other hand, are super sour & astringent before they’ve fully ripened. For this recipe, we’re using Fuyu persimmons! This recipe is simple to make, and similar to most other quick breads you’ve made. The wet ingredients are all whisked together, along with the coconut sugar to sweeten and the Fuyu persimmon puree. The flour is whisked together with the rest of the dry ingredients, including cinnamon, ginger, and allspice, and then folded into the wet ingredients, along with toasted walnuts and golden raisins – swoon-worthy, right?! 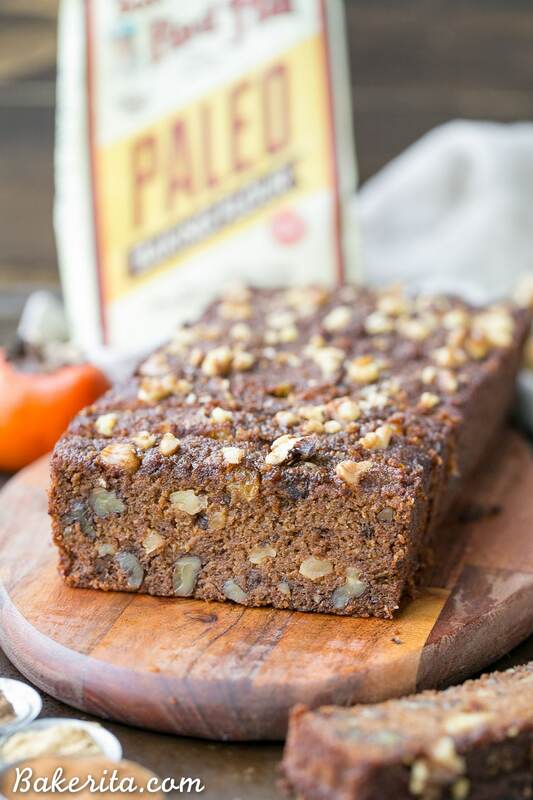 I’m super excited about the flour I used in this recipe, too – Bob’s Red Mill NEW Paleo Baking Flour. I talk about Bob’s Red Mill all the time and how their products are my favorite because they’re so high quality, and the second I saw their new Paleo Baking Flour, I had to get my hands on it to start experimenting. It’s a mix of almond, arrowroot, coconut, and tapioca flours, and it’s going to be a new kitchen staple around here! This loaf may be a little short and squat, but it’s full of flavor and has a soft, moist texture that’s exactly what you want out of a loaf of fruity bread. It’s a nice change up from the traditional banana or pumpkin bread, and a way to take advantage of the so often overlooked persimmon. Preheat oven to 350˚F. Lightly grease a 9x5” loaf pan with coconut oil. In a large mixing bowl, whisk together egg, coconut sugar, vanilla extract, and water. Whisk in the persimmon puree and melted coconut oil. In a separate bowl, combine the paleo baking flour, baking soda, baking powder, salt, cinnamon, ginger, and allspice and whisk to combine. Add the flour mixture to the wet ingredients and whisk to combine. Fold in walnuts and raisins. The batter will be thick. Spread the batter in the prepared pan and bake for 40-50 min or until a wooden toothpick inserted into the center comes out clean and when you press the top of the loaf, it bounces back. Cool in the pan for 10 minutes then turn out onto wire rack to cool to room temperature. Store tightly wrapped in the refrigerator. This bread looks divine! I need that new Paleo baking flour in my life. I have to say I’m liking th shorter days. It’s forcing me to rest which I need right now, but I’m ok with it being short weather too. This weekend was perfect weather! Thank you so much, Bethany! You’re going to have so much fun playing with that baking flour – I’m loving it so much. I hate that it’s darker earlier at night, but I love that it’s lighter earlier in the mornings! And it’s still pretty warm in the Midwest too…yay! This bread looks amazing, Rachel! I’ve never baked with persimmon before, so I need to try this! Persimmons are so underrated – they need some love! I’m loving the bright early mornings too, though. So nice having the sun up at 6 am when I am :) Thanks Gayle! 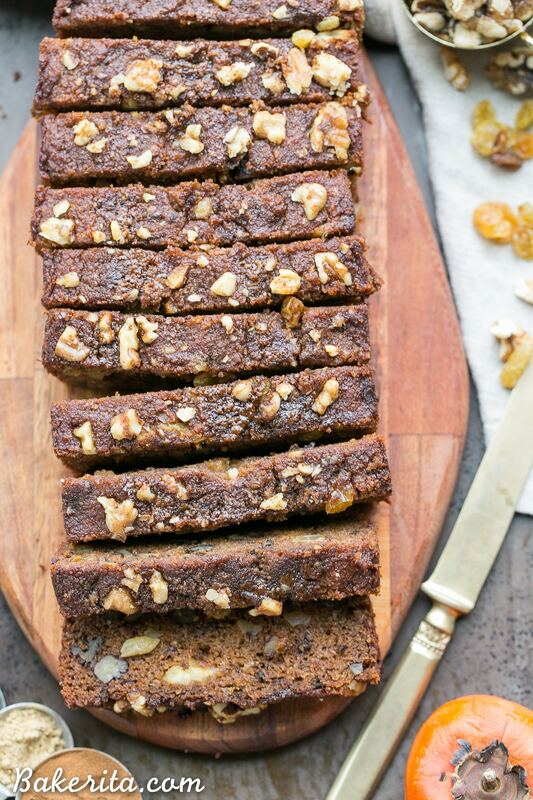 I never would have thought to put persimmons in a quick bread, but I’m sure glad YOU thought of it because this bread is totally STUNNING! I so need a slice right now to go with my coffee! Yes! I’m with you on missing summer nights! I’m in Alaska and the sun will set at 4:45 today! I do appreciate the coziness of fall/winter though :-) This bread IS totally swoon-worthy, Rachel! I’ve actually never tried persimmons before, though I’ve seen them in the store. I’m really not sure why! I’m completely inspired by this recipe though and can’t wait to try it out! Pinning! That’s a brutally early time for the sun to set, Stephanie! Persimmons are definitely underrated – they need some more love :) you should pick one up to try next time you spot them to give them a try. Thanks for the love and the pin! I definitely agree about the bright early mornings – I love them! I wake up feeling way more ready for the day when the sun is up with me :) you should try to track down a persimmon while they’re in season, Dawn. You’d love them! Thanks for your sweet words! Aw dang, you’re right about daylight savings time. I was totally just thinking about the fact that I technically get to wake up later. Haha. Omigosh, I used to live in San Diego and you’re making me miss it like crazy! The shorts, the weather, THIS bread! If only I could move back and perhaps be your ever-helpful taste tester? 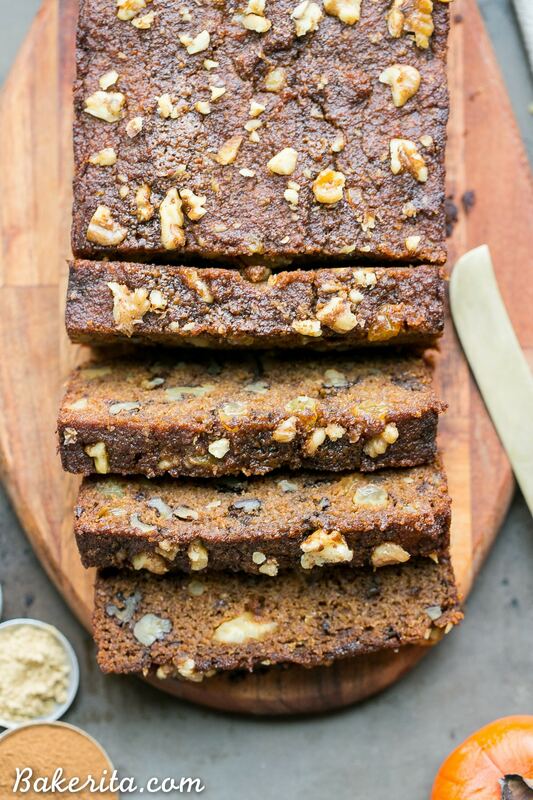 ;) Love that this is paleo and so perfectly packed with goodies! Haha I could definitely use some taste testing help!! You’re welcome to help anytime ;) thanks so much! Oooo I haven’t heard about that new flour mix from Bob’s! I need to try that one out! And this bread looks fantastic. I’ve actually never used persimmons in my own kitchen before – I need to change that! I haven’t experimented with persimmons yet but you are giving me motivation to, girl! Lovely photos as always Rachel! I’e been seeing persimmons everywhere recently and I have yet to try one, much less bake with them! They look delicious and this bread looks so dense and full of flavor- I really have to try this! I miss the sun too! It was dark when I walked home from work. Boo! This bread sounds yummy! Are you sure this is not for 2 loaves? I just baked it for over and hour and it is mushy inside…. Seems like it would have been perfect split into two loaves and cooked all the way through. Hi Rhonda, yes I am sure, or that would have been in the recipe. If your pan is smaller than called for, it would make it take longer to bake through. Would this work with Arrowhead all purpose gluten free flour? I’ve only tested it with the flour stated, so I’m not sure if it would work with that brand. Sorry!